A beautiful wedding dress in pristine condition. A lace and tulle sheer neckline and a chiffon cummerbund complement the chiffon skirt, which is accented with beaded lace appliqués. This style has a V-back and buttons that cover the back zipper and a scalloped chapel length train. 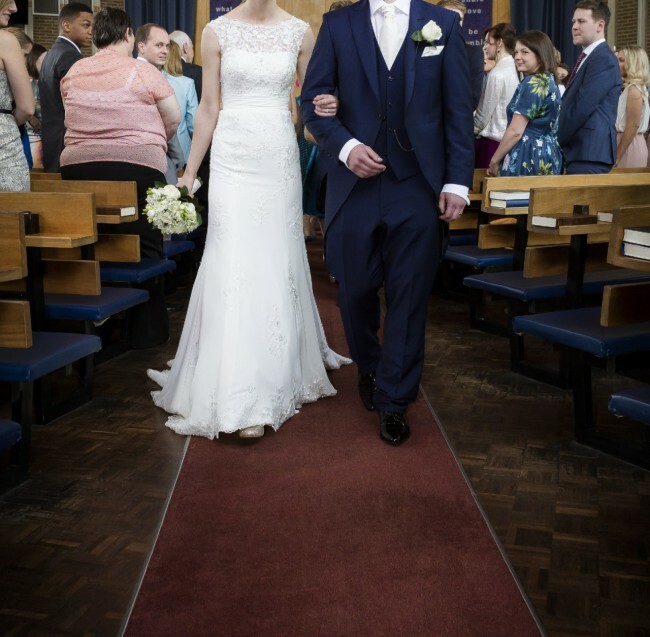 The dress is in the current 'Sincerity Bridal' collection and is style number 3730. I am 5 ft 9 inches and I wore 3 inch heels on my wedding day. A seamstress also added a bustle to the dress which would be useful if you wanted to shorten the train for your evening reception. The dress has been fully dry cleaned and will come with original garment bag. Please message me if you're interested or have any questions! I'm willing to negotiate a bit on the price.